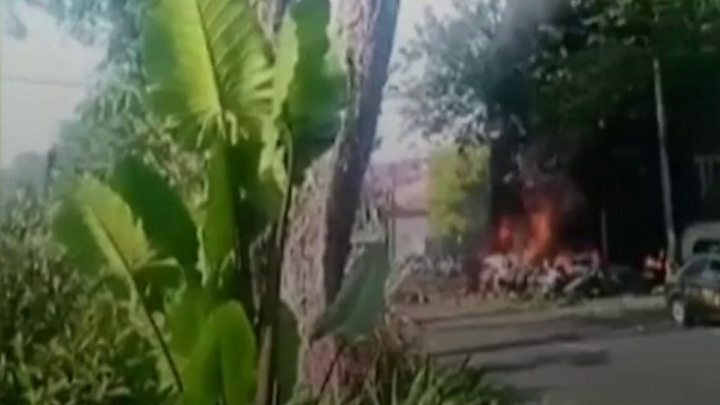 A suicide bombing at a police headquarters in the Indonesian city of Surabaya on Monday was carried out by a family of five riding on two motorbikes, police say. It came after another family carried out bomb attacks on three churches on Sunday. Police blamed an Islamic State-inspired network. An eight-year-old daughter survived the latest attack, police say. The archipelago, home to 260 million people, has seen a resurgence of Islamist militancy in recent years but the scale of the attacks in Surabaya has raised fresh concerns about the potency of jihadist networks. Video footage of the latest attack on the police headquarters shows two motorbikes approaching a checkpoint just before the blast. Six civilians and four police officers were injured, the authorities say. The young girl who survived had been wedged between her mother and father on the motorbike as they carried out the attack. CCTV footage shows her stumbling around after the blast. Why is Indonesia a target for IS militants? Indonesia was on high alert after bombings on Sunday by a single family targeted three churches in Surabaya, the capital of East Java province. The mother targeted one church alongside her two daughters, aged nine and 12, while the father and two sons attacked two other churches. The incident represented the first time a female suicide bomber had successfully carried out an attack, national police chief Tito Karnavian said. A 28-year-old woman had planned to bomb the Presidential Palace last year but was caught and jailed, he added. The authorities originally said the family of six were among hundreds of Indonesians who had returned from conflict-hit Syria but have since said the family did not actually travel there. The coordinated attacks killed 18 people, including the bombers, and injured more than 40. They were the deadliest bombings in Indonesia in more than a decade. Police say the father, Dita Oepriarto, was the head of the local branch of Jemaah Ansharut Daulah (JAD), an Indonesian IS-inspired network. The bomb that exploded on Sunday night in an apartment killed three members of a family who police said may have been planning an attack and had connections with Oepriarto. Pipe bombs were found. Separately, police said on Monday that they had arrested six people plotting attacks in Surabaya, the Jakarta Post reported. President Joko Widodo has described the attacks as "cowardly, undignified and inhumane" and said he will push through a long-awaited anti-terrorism bill if parliament does not pass it. The bill has faced criticism from human rights groups, but defenders say it is needed to prosecute militants returning from the Middle East. "There will be no compromise in taking action on the ground to stop terrorism," he said. Officials said police, backed by military forces, would increase security across the country. In Australia, Prime Minister Malcolm Turnbull said the nature of Sunday's attack - involving an entire family - "almost beggars belief". "These people are the worst of the worst. They are threatening civilised nations, they're threatening civilised way of life. They're threatening people's harmony and religion. They are debasing and defaming Islam, as President Widodo has often said." The South East Asian country has long struggled with Islamist militancy. Indonesia's worst ever terror attack was in Bali in 2002, when 202 people - mostly foreigners - were killed in an attack on a tourist nightlife district. That attack was carried out by the Jemaah Islamiah (JI) militant network and prompted a sustained crackdown on militants. The first attack claimed by IS in Indonesia took place in January 2016, when four civilians and four attackers were killed in a series of explosions and shootings in central Jakarta. IS-inspired groups have since mostly carried out "amateurish" plots but the attacks in Surabaya suggest better planning and a higher level of "technical proficiency", Zachary Abuza of the National War College in Washington DC told the BBC. The use of children in the attacks was "absolutely unprecedented" in the region, he said, and speaks to the "ideological indoctrination" of JAD. • JAD campaigns for a caliphate system across Indonesia and says it is "justified in using violence" to do so. The group encourages attacks on the police, which it regards as "infidels"